This section should be read in conjunction with the main It's a Setup page. The screen is too low, pulling your head down. The keyboard is too far away, pulling the elbows forward and up. The screen is too close, making your eyes work hard to focus on it. 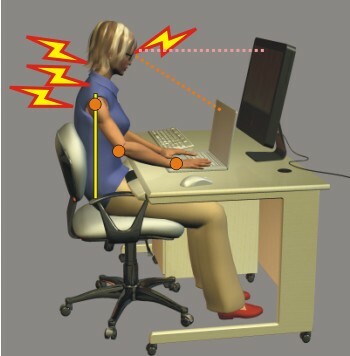 Thus, overuse injuries may occur in the eyes, neck, shoulders and back. 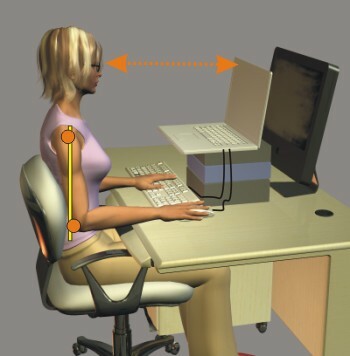 The high elbow position may also lead to wrist problems. In general, Laptops and Notebooks are not suitable for intensive or prolonged use, on their own. You can make a big improvement by using a separate keyboard and mouse, connected to your laptop. 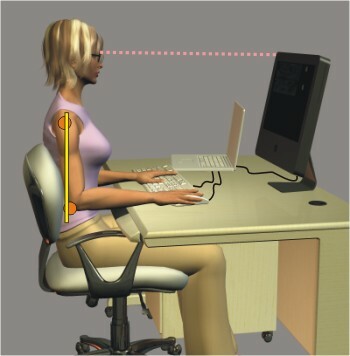 Then by raising the laptop to the height of a normal screen, the posture problems can be solved. The one remaining problem is that the screen will normally be smaller than a desktop screen, so it has to be closer to the eyes. This means the focusing muscles in the eyes have to work harder. ...by plugging in a desktop monitor, you can have the same quality of setup as a full desktop computer. The laptop itself can be placed anywhere convenient (on most models you can close the lid while a monitor is connected). If you are choosing a laptop/notebook computer, check that it has a suitable port for connecting an external monitor. Check the price and exact benefits of a docking station before you decide to use that method. Then you can follow the normal setup process for desktop computers. ..